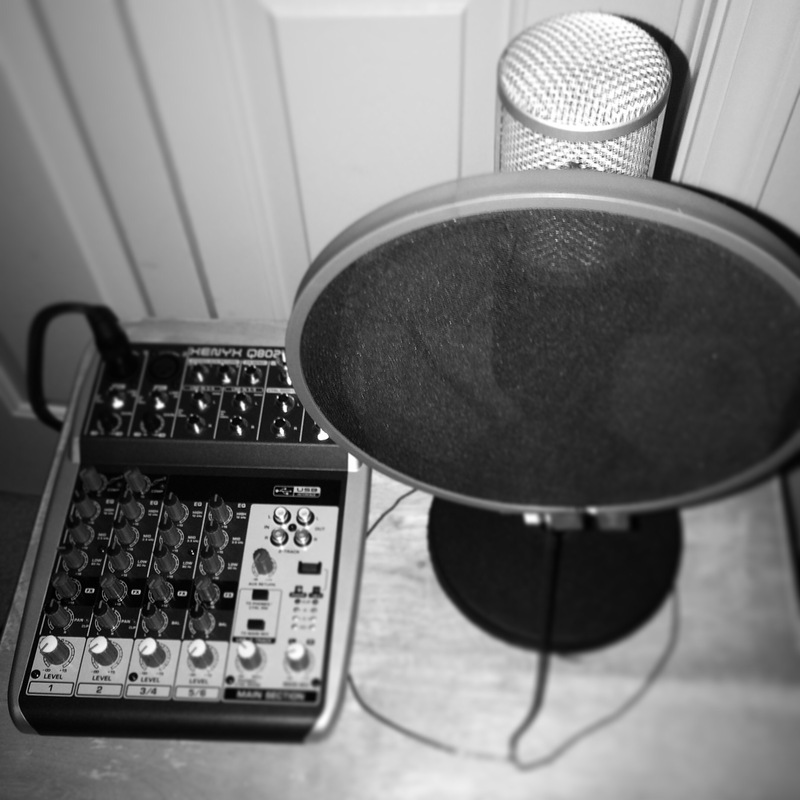 Getting the home studio ready for the 1st episode of the Multifarious Man Podcast. Saturday September 19 is only the beginning. In the past I have used the posts in this blog to share essays, my thoughts on politics, personal stories and ideas; I felt like making a change. Mind you, I am still the same person and my socio-political views have not changed. Looking over my extensive media collection, (based on my own definition this includes: movies, books, music in all of the physical and digital forms), I realized that my tastes are various quite eclectic. As such, the Multifarious Man was born. The Multifarious Man blog and podcast will be where I share with you all of the things that I love/hate, like/dislike in the world music, film, theater, and books. This will include both the artist and the art that they create. I will sprnkle in my love of video games and technology. Along the way I will share essays, reviews, interviews and new discoveries. In 2015, maybe we should all agree to try something different. If someone posts “I can’t breathe”, instead of accusing them of being anti-cop or pro-criminal, give them the benefit of the doubt and tell them that you agree that the justice system does not treat everyone equally. Ask them what do they think can be done to make things better. The next time someone posts, “Breathe easy, don’t break the law,” assume that the are only saying that they support law enforcement and not that they don’t believe that you have the right to peacefully protest. Maybe we should all admit that crime and injustic impacts everyone, regardless of your skin color. Police Officers are human, and they make mistakes. Unfortunately due to the nature of their job, when they make mistakes, the results can be tragic. If a white cop kills a black man, it does not mean he is racists. But we have to be mature enough to admit that cultural conditioning and bias do exist. The environment we live and work in, does impact how we act or react to any given situation. Police should have better training, and it is not just about tactics. Using a firearm, and self defense techniques are only part of the equation. There has to be more emphasis on the community interaction and the psychological aspects of a high stress job. If all of your contact with the community is negative, then bad things will happen. On the other side of the coin, we need to do a much better job in our communities ensuring that we know the men and women that chose to protect and serve. Every day they go out, they know they may encounter a life or death situation. Do you really think cops want to pull you over for speeding on the interstate? Traffic stops are one of the most dangerous aspects of law enforcement. Not only are you operating without back up, but you have to be concerned with moving traffic and the unknown of what you will find when you approach that car. How about we all agree to observe the posted traffic laws? And if you get pulled over, you should just be courteous and cooperative. If you live in a high crime area, how about working with the investigators and stop pretending you didn’t see anything. “Snitches get stitches” is probably one of the stupidest “hood” sayings that I have ever heard. I get that people want to protest against police brutality, but you must admit that your message gets lost when you accept criminals, and criminal behavior in your community. Perhaps Starbucks has it right. Have you ever noticed the cross-section of society that you will find in you average Starbucks? You will find people of every race, religion, color, and vocation. I know it is oversimplifying race relations, but you have to start somewhere. The next time you are on line for your java fix and you see a police officer, say hello thank you. If you are on patrol, stop and that ball field and introduce you self to the kids and parents. If we remember all the things we have in common, then maybe we can start to see things from the same point of view. I’m sorry that my protests are inconvenient. That you were late for work and missed your latte. I’m sorry that people commit a high percentage of crimes against the people that look like them, or live near them. I’m sorry that criminals are lazy and find travel inconvenient. I get it. No really, I get it. After Cain slew Abel, if you had started suspecting every sibling whenever there was another murder, it would have made sense to suspect every male sibling, because based on your statistics, every murder had been committed by a male sibling. I know it’s not your fault that people are protesting the perceived injustices perpetrated by the systems and people that are supposed to serve and protect the people. How dare they prevent you from going about your daily lives without having to think about the plight of someone that doesn’t look like you, or live near you, or pray like you do. Imagine if the police stopped you and searched you whenever you drove past a school because someone that looked like you slaughtered children with an assault rifle. Or if you had to be stopped and frisked every time you went to a movie theater because a madman that looked like you massacred innocent people. Would it be right for me to take my savings out of your bank because you look like someone that ran a Ponzi scheme. I feel sorry for you when you hear people are protesting and you have to take five minutes out of your commute to ask Google or Siri what’s going on. I am sorry that the inconvenience forces you to post snarky comments that the protestors probably don’t have jobs. Or that your regularly scheduled programming is preempted so that the local news can report about the protests. I am sorry that you are infuriated whenever a dog kills someone people say Pit Bulls and Rottweilers are too dangerous but you don’t bat and eye when politicians get on television and say that the only reason black and brown boys are profiled by the police is because they commit crimes against their own. I’m sorry that you read this and think I am comparing pets to people. America I am truly sorry that when you turn on the news and hear about crimes, terrorism, and injustice you only see it as the inconvenience caused by other people’s problems. Those people are killing themselves, or those people need to get a job. Dear America I am sorry that you can’t see that there are evil people in the world and good people in the world. I am sorry that all you can see is the statistics of race and not the fact that laws exist because it is in human nature to sin. People commit crimes for many different reasons, but race is not one of them. The difference between the Bernie Madoffs of the world and the common street criminal is that there is not difference. How many people are homeless or were driven to murder suicide because someone in a suit took their life savings. The criminal with a pen affects millions while the criminal with the gun only affects a few. The difference is how the legal system treats them both when they are caught. You expect the street thug to go to jail forever but you are not angry when the “white collar” criminal gets a fine and a small sentence. I am sorry that when someone holds up their hands and says “don’t shoot” or wears a shirt that says “I can’t breathe” you instinctively see it as attack against the fine men and women in law enforcement and not the cry against injustice that it truly is. If you hit me with your car by mistake or on purpose I am still injured regardless of intent. Don’t get mad at me if I demand to know why something happened so it doesn’t happen again. Dear America I am sorry that is nearly 2015 and we have to discuss race because bias and prejudice exist. Having a bias or being prejudiced does not make a person bad or evil. Ignoring the fact that our actions are driven by the bias and prejudices of our experiences and the experiences of our community, that’s the real crime. A long time ago, in an office park or factory far, far, away, work ethic mattered. You punched your clock, worked your hump off during your 9 to 5, and then you went home. Monday through Friday, for 50 weeks of the year, wash, rinse, and repeat. White collar or blue collar, it didn’t matter, you didn’t phone it in, you worked hard from whistle to whistle. You were proud of not only what you did, but how you did it. Hard work was rewarded and it was it’s own reward. I have been working one job or another, full and part time–sometimes both–since I was 16 years old; 23 years. From my first jobs in the New York City Summer Youth Program and McDonald’s all the way to now, my parents instilled in me the importance of always doing your best. To borrow a phrase from the old Air Force recruiting campaign: Aim High. Somewhere along the way things changed, society changed. Now it seems that all the effort is being put into people doing their best to be adequate. People want to do as little working, thinking, and producing as possible. They want to be paid great sums for simply showing up and leaving on time. A job, and to a greater extent a career were investments. Now people treat them like a rental car with full insurance. Drive it as hard as you want, flying over speed bumps and potholes and then just leave it in the parking lot with the keys on the dash. So what if you left it in worse condition then you found it. Doesn’t matter, you don’t own it, it’s someone else’s problem. You were just along for the ride. People want to be reward for success without taking any risks to make it successful. Mediocre is the new standard. I don’t know if it happened when our kids’ sports leagues started being all inclusive. You sign up, you pay your money, you play. Skill didn’t matter. Effort didn’t matter. As long as you showed up, you got a trophy. Everyone goes to the tournament. When I was a kid, you had to try out and make the team. Then you had to try out again for the all-star team. Only the players on the winning teams received trophies and awards. Maybe because we conditioned ourselves to believe that showing up on time was all that mattered, we stopped caring about things like pride and effort. I guess if you know you are going to get paid not matter what, why bother doing anything other than taking up space. Depend on someone else to tell you exactly what to do and do not deviate from the plan. That way, if something goes wrong you can point fingers and say you only did what you were told. No need to think for yourself and take ownership of a project or unexpected problem, just raise your hand and say “present” when attendance is taken. I refuse to be mediocre. Me and my wife are raising our daughters to always do their best and not just stand up and be counted. They are being taught to be leaders and not followers. To interact and be a part of not only powering the ship, but steering and plotting the course. There will be pitfalls and icebergs along the way, but keep your head up and adjust as needed. They will experience failure and success, but they will never be satisfied with just being along for the ride. Can you imagine if the Wright Brothers stopped at just getting of the ground and traveling a short distance? Build a canal? No, let’s just take our boat around South America, it won’t take too long The phrase “shoot for the moon” should have meaning again. The sky isn’t the limit, it’s just a stepping stone on the way to greatness. Of course if you are happy being mediocre, go right ahead, you’ll be working for my kids one day. Like many people, I sat in anticipated disbelief when the verdict was read in the George Zimmerman second degree murder trial for the shooting death of Trayvon Benjamin Martin. Anticipation because that part of my brain that has known the difference of right from wrong since I was a toddler believed there was no way that a man could profile, follow, confront, and kill a teenaged boy would be convicted of some if not for all of the crimes for which he had been charged. Disbelief because I knew that history has shown that the lives of young black males in the country are not held in high regard so there was now way that the jury would find him guilty. I keep hearing that this case had nothing to do with race or racial profiling, but how could it not? By his own admission, George Zimmerman followed Trayvon Martin because due to a rash of burglaries committed in the community reportedly by black males, one of which had been found with stolen property, and Travyon, a young black male, fit the profile. He was seen walking slowly in the rain wearing a hood which obviously was suspicious because in the absence of an umbrella, only someone up to know good would wear a hood or walk slow. According to the American Civil Liberties Union (ACLU), racial profiling refers to the discriminatory practice by law enforcement officials of targeting individuals for suspicion of a crime based on the individual’s race, ethnicity, religion, or national origin. Criminal profiling, generally, as practiced by the police, is the reliance on a group of characteristics they believe to be associated with crime. On the night of February 26, 2012, George Zimmerman, carrying a legal firearm, acting as the Neighborhood Watch captain, followed Trayvon Martin in his vehicle, at some point exiting the vehicle, and after an altercation, intentionally pulled out his firearm and shot Trayvon once in the chest. Initially after observing Trayvon, George Zimmerman called the local non-emergency phone number and informed the dispatcher that he was “just walking around looking about” and saying “This guy looks like he is up to no good or he is on drugs or something.” At some point he lost sight of Trayvon and exited his vehicle advising the dispatcher that he was still following him. The dispatcher told him, “We don’t need you to do that.” While this is not an explicit instruction to stop following him, it was certainly implied. The call ended and within several minutes, based on eyewitnesses and Mr. Zimmerman’s statement, an altercation ensued ending with Trayvon Martin’s death. Once the police arrived at the scene, several minutes later by approximately 7:17 PM, Trayvon was laying face down dying or already dead. As the only other true eyewitness could not make a statement, Mr. Zimmerman’s account that he acted in self defense were eventually accepted and he was not charged with crime. My purpose here is not to cover the initial investigation by the Sanford police department and subsequent public outcry which eventually led to State’s Attorney’s office charging George Zimmerman with second-degree murder on April 11, 2012. What concerns me is that although the defense attorney’s did not use Florida’s “Stand Your Ground” as part of their strategy, merely claiming self-defense; the jury instructions did cite this law. After the acquittal, the woman known as Juror B37 stated that Mr. Zimmerman “started the ball rolling” and could have avoided the situation by staying in his car. “He was justified in shooting Trayvon Martin.” Now I have to assume that they jury understood the law, understood the instructions, and based on the evidence in the case, had no choice but to find George Zimmerman not guilty. Fortunately or unfortunately, depending on how you see it, my common sense tells me the he was guilty of manslaughter. According to Florida Statute 782.07 subsection 1, “The killing of a human being by the act, procurement, or culpable negligence of another, without lawful justification according to the provisions of chapter 776 and in cases in which such killing shall not be excusable homicide or murder, according to the provisions of this chapter, is manslaughter…” Of course I would be remiss in not showing the aforementioned provisions of chapter 776, specifically 776.013 “Home protection; use of deadly force; presumption of fear of death or great bodily harm” was the basis of Zimmerman’s defense. Subsection 3 of 776.013 reads: A person who is not engaged in an unlawful activity and who is attacked in any other place where he or she has a right to be has no duty to retreat and has the right to stand his or her ground and meet force with force, including deadly force if he or she reasonably believes it is necessary to do so to prevent death or great bodily harm to himself or herself or another or to prevent the commission of a forcible felony. My question here is, didn’t Trayvon Martin have a right to defend himself if in his mind, George Zimmerman, a stranger, was attacking him? (1) Is attempting to commit, committing, or escaping after the commission of, a forcible felony; or (2) Initially provokes the use of force against himself or herself, unless: (a) Such force is so great that the person reasonably believes that he or she is in imminent danger of death or great bodily harm and that he or she has exhausted every reasonable means to escape such danger other than the use of force which is likely to cause death or great bodily harm to the assailant; or (b) In good faith, the person withdraws from physical contact with the assailant and indicates clearly to the assailant that he or she desires to withdraw and terminate the use of force, but the assailant continues or resumes the use of force. Unfortunately, based on the language in subsection 2 and 2a, both Trayvon and Zimmerman were well within their rights. To quote William Shakespeare, “aye, there’s the rub”. Trayvon is dead and Zimmerman is alive, so he is the only one that can make this claim. My common sense argument is that Zimmerman got out of the car knowing that he had a gun to defend himself. He brought the proverbial gun to a fist fight. Does anyone doubt that George Zimmerman is what I like to call an Iron Thug? This means that without the gun, he never would be emboldened to get out of the car in the first place. There a lot of people in the world that need a firearm to make them feel brave enough to get into an altercation. This is the problem with the law. Now as the framing fathers owned slaves, I don’t have any illusions that at the time it was written that this included the general Welfare of my ancestors, the document is powerful as it did allow for the later Amendments that provided a course correction which ended slavery and granted rights people of color and women. With all of it’s faults, this is still the greatest country in the world. I just have problem with laws that allow people to legally infringe on the right’s of others. Trayvon Benjamin Martin had every right to walk to the store, buy Skittles, and an Arizona Iced Tea, and walk home unmolested by an overzealous Neighborhood watch volunteer with a loaded gun and aspirations of being a hero. Your right to bear arms should not supersede my right to be left alone and when threatened defend myself with my fists. The tragedy is that George Zimmerman gets to live with his mistakes, Trayvon Martin died because of those same mistkes. Our unconscious minds allows us to relax, create, and discover the unknown. When we sleep at night, our dreams unleash our imagination to discover new worlds and ideas. It is there that we discover Narnia, Middle Earth, Westeros, and Tatooine. Last night I discovered a world where smart cars had evolved into humanoid form and had become the heroes of modern legend. Can there be a story hidden in the clouds of my imagination? I wonder.